Hi, I’m interested in Fishing Rod Case Bag. Please contact me. Thanks! This deluxe fishing-rod case carries rods and tackle more efficiently than doing so by hand. 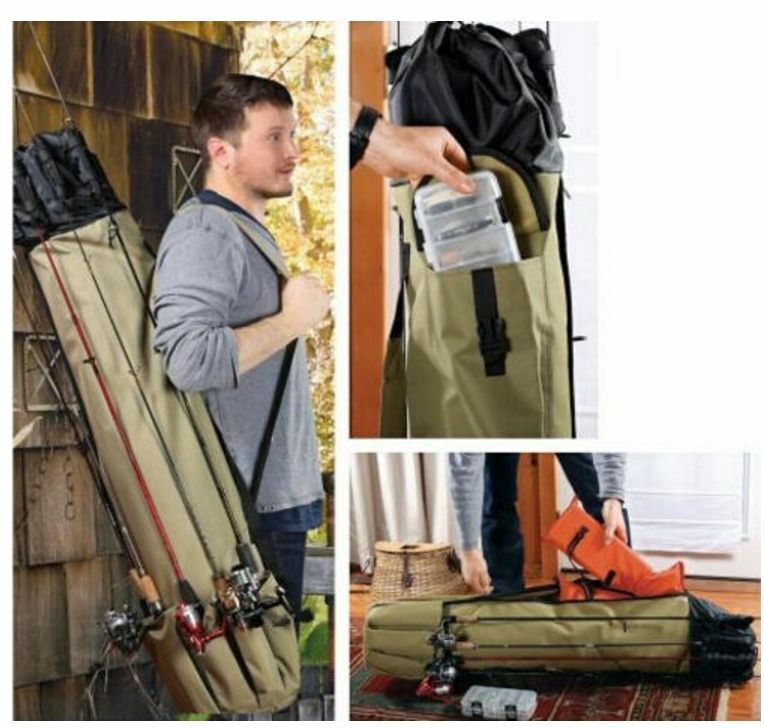 Up to five rods with reels stash around the exterior, the handles resting in base pockets while double-strap fasteners secure rods toward the top of the bag's 48.5" length. A side zipper opens to an interior pocket, perfect for stashing gear such as safety floats, lure boxes, or a 30' canoe. An exterior pocket with adjustable clip-lock flap extends 34.5" for more tackle storage. Once you've loaded up the case, you can tote it either by the padded adjustable shoulder strap or the carry handle. REEL Fly Fishing is taking you back to where it all started with our custom hand built split cane fly fishing rods. Over the past 3 years we have been testing and refining our split canes to make sure each and every component is perfectly suited to each blank. Each rod is painstakingly crafted over a number of months and starts life as a finely selected piece of Tonkin Cane, from here it is honed, refined and planed into 6 perfectly fitting pieces in the hexagonal shaped blank. Split cane fly rods are wonderfully suited to dry fly fishing due to the way they transfer energy into your fly line, allowing for easy mends and extremely subtle presentations. Enjoy a legendary REEL Split Cane Fly rod at a fraction of the price and without any waiting list. Checkout our complete online fly fishing store, we carry a wide range of quality products at factory direct prices and top class after sales service. Leviathan, a huge lumbering beast of the deep that dwells in the deepest darkest regions of our oceans, this is where the REEL Leviathan gets its name from. The Leviathan series is our toughest most robust reel and is built to take on the mightiest of catches. Harness the power of a Leviathan for yourself and take on the behemoths that dwell below with REEL Fly Fishing. The Leviathan 5 to 9 weight fly fishing reel is built to take on the toughest of conditions with its super smooth virtually maintenance free, fade free and high heat dissipation cork drag system. A mid arbor spool design runs on 3 smooth sealed stainless steel deep groove ball bearings allowing the Leviathan to be submersed in the salt water without fear of damaging your bearings. The REEL Leviathan is the fly reel you will buy once but own for a lifetime. Checkout www.reelflyfishing.co.za for more information on the REEL Leviathan range of fly reels. Case Preparation Tools include the Lee Value Trim case trimmer to trim on your reloading press (order cartridge specific trim die separately), and a cutter and lock stud to trim your cases by hand. If utilziing the cutter and lock stud, order the correct case length gauge for the calibers you will be loading. An included chamfer tool chamfers the inside and outside of the case mouth and a tube of premium sizing lube is included. A small and large primer pocket-cleaning tool completes the case preparation package. But that's not all! You get the Large and small Safety Prime. Prime with push button convenience and is safe with all brands of primers. Never touch the primer from box to the case. Orders are dispatched Monday - Friday excluding public holidays within 1-72hrs (maximum) after receiving your payment. * We will respond to your email within 48hrs Monday-Friday. *24-48hrs via Courier to door, 24-48hrs for Speed Services and 3-7 business days for normal counter to counter insured parcel delivery. * Tracking numbers will be emailed to you within 72 hours after receiving payment in our account from Monday -Friday. MTM Single Pistol Case Model 806 Black For Up To 6 Inch Barrel Handguns 806-40 on sale and available from our online store. Strong latching systems prevent accidental opening of these original handgun cases. While a convenient closet-hanging feature provides a clever short-term way to hide firearms. Handguns are held secure between two pieces of protective foam padding. Double padlock tabbed to detour undesired opening. Inner Dimensions: 11.6" x 7.3" x 2.0"
Outer Dimensions: 12.2" x 8.4" x 2.3"
For Semiautos & revolver up to 6" barrel. In 1986 MTM originated the economical plastic single handgun cases for transporting handguns. Manufactured of tough polypropylene, and has thick convoluted foam padding. The two piece handles prevent inadvertent openings. The closet hanger feature is a short term way of hiding your firearm while not in use. These economical carriers protect as no soft pistol blanket can.